This week’s rather big update is all about your user experience learning Chinese. Thanks to your feedback, we’ve added a lot of new things in this update, including what we gave away in the title but not only! So now, you guys know what to do: experience the changes on Ninchanese and give us feedback! But first, you can read up on the improvements below. We want you to be able to use Ninchanese everywhere: on your computer, on your tablet, on your phone… So making sure you can browse and use Ninchanese smoothly whatever the device you’re using is one of our priorities (I really want to use Ninchanese on my phone too!). Little by little, we’re working on improving the layout of Ninchanese on different screen resolutions. We’ve just redone some of the pages, such as the level selection screen where you choose what you’re going to do. Go on, give it a try, whip out your phone or resize the page. We guarantee it’ll look nice, whatever your screen (almost). Many more responsive improvements are coming in the next beta updates! Nincha put his paw down: No more displaying answers with definitions that were extremely long and tough to read, not to mention sometimes were cut-off in his vocab stages! Now, answers are displayed in a nice, numbered, orderly manner, so you can easily see what a word means, and get an idea of how many different meanings it has! You’ve been asking for this, and this beta update has listened. Now, when you get a word right in the vocab stages and in your reviews, it’ll play automatically! By hearing the sound more, you’ll be helping your brain make more associations and memorize the sound as well as the visual representation of the word. When you click on a block in the sentence building stage, you’ll also be able to hear the sound! Mewsic to your years, right? Perhaps this sounds familiar: you entered an answer, confident it was right, only to realize you gave the reading of the word in pinyin, rather than its meaning in English… Since the system was expecting English, your answer was counted as wrong. Well, good news, there is now a popup that gently lets you know that you entered the right word, but in the wrong language! You’ll therefore get a second chance to try again, albeit in the right language. We bet this was a major source of frustration for some. Now it’s gone. Sweet, no? Naturally, if you get the answer wrong, no matter in what language, your answer will still be be counted as wrong. Feeling a little confused about the word you just saw? Would like to have more information on it? Just hit help in the vocab stages and Nincha will take you straight to that word’s page, where you’ll be able to see the word’s stroke order, read example sentences, so you can understand how that word can be used and see how it behaves in context, and more! Pick: go back to the selection screen or continue? You Clicked Continue? Skip selection. Go straight to the next stage. Don’t collect 20, 000. Uh, no, this is not Monopoly. Still, we’ve added a new “next stage” button that’ll take you directly to the next stage without breaking your flow. Ain’t that cool? 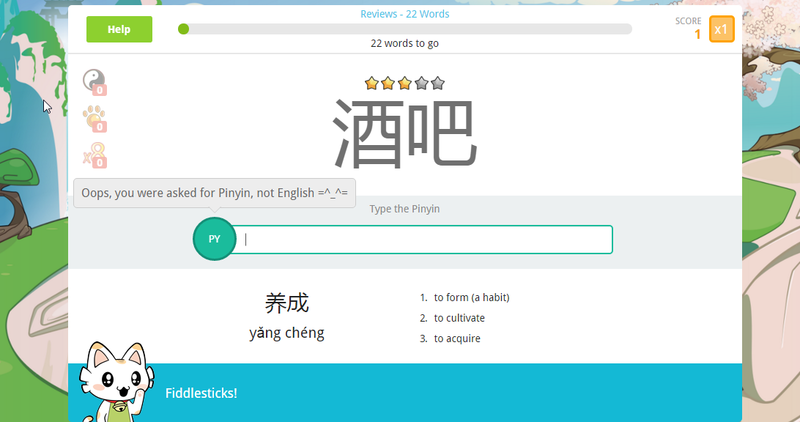 The next button is great when you want an uninterrupted study session in Mandarin Chinese! As you learn words and get them right in your reviews, your memory level improves; this lets the Great Nincha Machine know you’re starting to know that word pretty well and can push back when it’ll show you the word again. These stars were already visible in your word list, but we’ve decided to make them more visible: you can now see them in the vocab stages and in the reviews! They are an indicator of your progress and a better way to see where you are at in pushing that word in your long-term memory. We’re likely to be toying with these stars some more, so let us know what you think of them as they are now and if you see a need to improve them! bug fixes: they’re spotted, they’re squashed. Word corrections: I corrected several words by adding some of your definition suggestions, fixing a typo here and there, and adding more example sentences. We also are gradually introducing British spelling for words, if you see any more that need British spelling, let us know in the feedback interface! These are little things we correct everyday as soon as we or you spot them, so if you see any such thing, you know what to do! We hope you enjoy these improvements and they help you learn Chinese even better. Our commitment to bringing you an enjoyable and efficient Chinese learning experience is strong, so please, let us know what you like and don’t like, and what other features and improvements you’d like. As always, we’re looking forward to your feedback! With Ninchanese, enjoy learning everything you need to know to really speak Chinese! The web app is now in beta so sign up now to join the Ninchanese beta! Stay in touch with us on Facebook, Twitter, Google + and Pinterest and pre-order now to get access to the full beta! Voice and stroke order animation update More Chinese Words for Ninchanese We have a winner! World 2 is here!